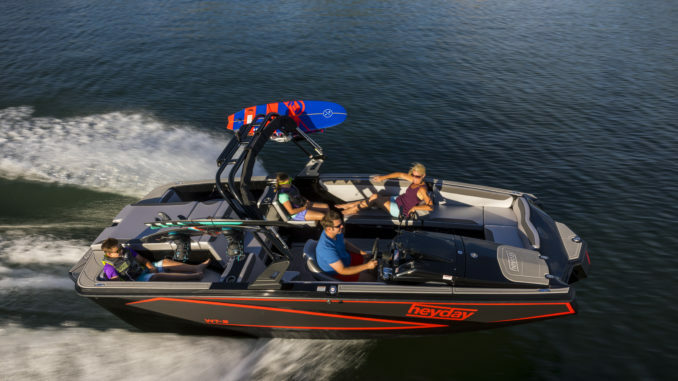 The Bayliner Heyday WT-2 is a really new and innovative boating concept for wake boarders or wake surfers. 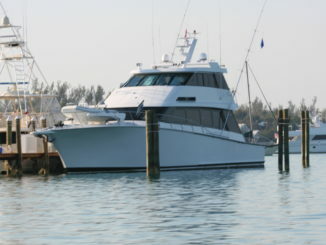 It is also a boat with lot of qualities, an interesting layout and a very attractive price. With a very specific design and aggressive price, the Bayliner Heyday WT-2 is like a UFO in the world of the sports boats, bringing a fresh wind that should somewhat upset the market. 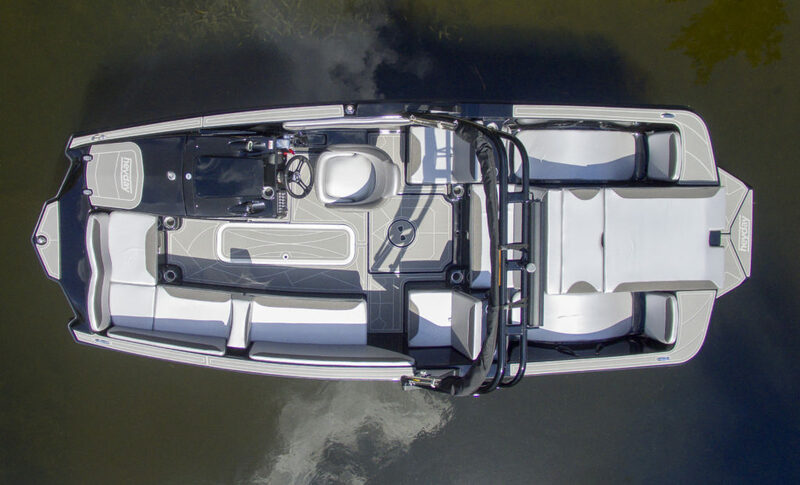 In just a few years, the world of sports boats has changed completely with the emergence of more ambitious units using technologies able to offer a conclusive experience for skiers or wake boarding enthusiasts, displaying a price well below that of specialty water-skiing boats. 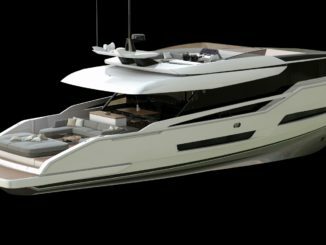 The Heyday shipyard pushed the concept even further, proposing boats with a very different look at a very good price. This is precisely what interested Bayliner, who bought the brand a year ago, adding to its catalog three models entirely dedicated to sledding. The WT-2 is the biggest of the series with 22’6’’ length and 96’’ m width, which makes it easy to transport on the road. Regarding the look, the WT-2 really breaks the codes. Very square, it features a very open trident prow and a much-angled transom giving it a unique look. The very straight and relatively high sides are as unusual as the cockpit placed very forward on starboard. The line is, however, very sporty although the design gives the impression that we are dealing with a very short boat. This is a deceptive feeling, because once on board, it is exactly the opposite. The boat seems bigger than it is. An impression given by the layout deck, which truly uses all the available space. 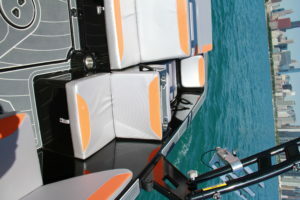 The starboard is occupied by the console, very sporty, but unfortunately without good protection. Besides the controls, it conceals a storage in its front part. 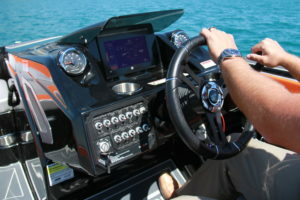 Despite its modest size, this cockpit is complete enough with the possibility to attach a tablet using the Bluetooth communication system in the engine. But don’t forget to protect this accessory well. On the port side, a large L-shaped bench offers a lot of space and it is complemented by two small seats a little more on the back. There is storage under this long seat and you can also use the floor box. If you buy the option, you can install a table in the center of the cockpit but unfortunately, it is not possible to transform this area into a sunbath. It is a pity. The rear part is more unusual since outside the small sunbath covering the engine block, there are on each edge “lounge” seats usable in both directions. Relatively comfortable, these mini sun lounges would benefit from being more accessible, but the idea is good. Finally, there is no storage underneath, because it is the ballast location. Original, this layout still simple and rational and the deck is surmounted by a pretty wake tower delivered in standard. 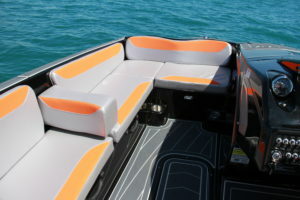 Even if it’s not a luxury boat, the manufacturing is serious and the finish is very correct. The standard equipment is still basic, but it is also the recipe to getting a competitive price. It’s up to you to take your pick in the options catalog to customize the boat according to your wishes. The WT-2 has real ambitions in the sledding universe and for that, it uses an unprecedented hull, specifically designed to create a beautiful wave while using a minimum of expensive equipment, the opposite of what some very famous brands do. The hull has an angle of 117 ° on the rear and its efficiency is really surprising. Equipped with a 320 horsepower Mercruiser, we measured the time to plane to be just 2.2 seconds. Dynamic, wouldn’t you say? If you really need to go back to the marina quickly, the boat is also capable of sailing at almost 38 MPH, but that is not its program. 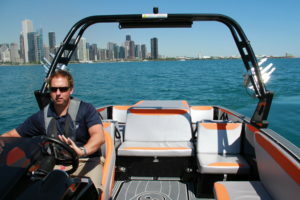 The WT-2 was really designed to tow a skier, a wake boarder or better, a wake surfer. For this, it has 1 800 Lbs of ballasts. There are no electronics to control the filling, but a simple button Observation of the overflow suffice, all in about ten minutes, it is simple and economical. 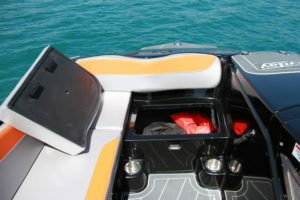 Once ready, you can use the profile of the rider and the boat will automatically adjust its speed. Behind, it is clear that the wave is enticing and the riders will enjoy it. Once the session is over, the ballasts are emptied with the opposite operation and you can use the boat to cruise. Again, we were surprised by the softness of the hull. 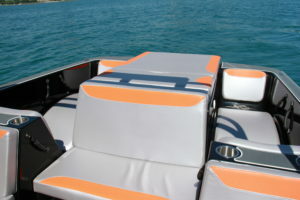 Quick and sporty, it is still comfortable and does not mistreat the crew. It is even fun to drive. 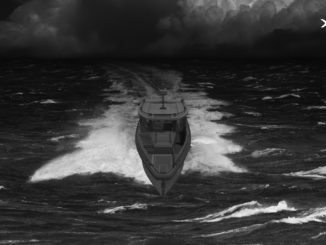 The Heyday WT-2 is available with a 350 horsepower engine from PCM or Mercruiser (only Mercruiser in Europe), a power perfectly adapted to its program.